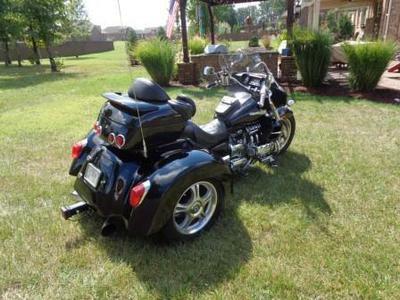 The 2001 Honda Valkyrie Trike for Sale is a black 2001 Honda Valkyrie Interstate Trike 1500 with a RoadSmith Trike conversion kit that was installed in 2007. The motorcycle has had recent maintenance, a new windshield, battery, Road Smith master brake cylinder, oil change, radiator flushed, new anti-freeze, and a front tire replaced on it one year ago at 2,100 miles. The Valkyrie Interstate has a trailer hitch, a luggage carrier and a Corbin custom seat. 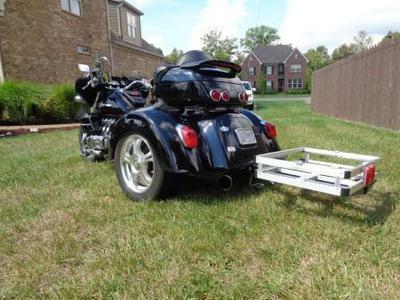 and then take a look at how nice mine is that comes with a backrest, a handmade leather take bib with chrome engine accessories and Dual 4” Diameter custom exhaust pipes that gives this used trike a very sweet sound. The used Honda trike for sale has been garage kept and is very clean. 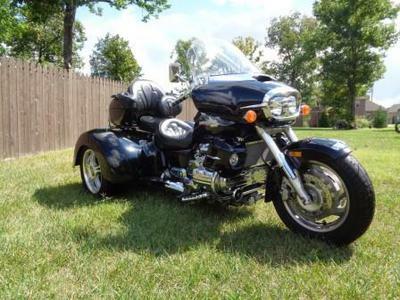 The 2001 Honda Valkyrie Trike for Sale is in Mount Juliet, TN Tennessee and is a must-see and you will also want to test ride this great touring bike with just 46,781 miles! I am asking $15,500 or you can contact me using the form provided by GoGoCycles Used Motorcycles for Sale to send me your best offer.